According to Frostbite Falls denizens, Rocky and Bullwinkle, cold weather vacations are the best. The mountains are more majestic, the snowy plains look new and fresh, and the icy waterfalls are studies of frozen motion. 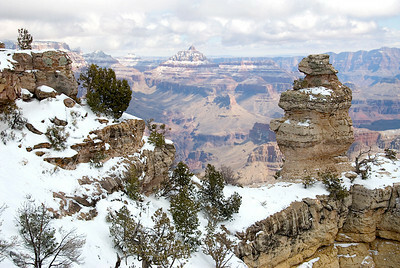 There are tremendous photographic opportunities while traveling in cold-weather destinations. But there are also challenges you must overcome to bring home photographic travel memories from places like Montreal and Reykjavik. When you go outside into cold weather from a warm hotel, if they’ve pushed the inside humidity above 35 percent, there may be some initial fog on your lens. Don’t wipe the fog away, it will dissipate quickly on its own. Having enough battery power is the biggest problem for electronic cameras in frigid weather. Cold temperatures sap battery energy even when not in the camera. Today’s digital cameras are totally dependent on battery power. I carry spare batteries in my parka’s inside pockets, close to my body. The warmer the battery, the better it will perform. When taking a long series of photos, I rotate my batteries to stay out shooting longer. You also need to keep your camera as warm and dry as possible. In freezing weather, I keep my camera under my parka, except when taking photos. I may look a little silly with that bulge at my chest, but I’m still taking photos when others’ batteries are dead. Falling snow may seem benign compared to rain, but snow can cause just as much damage. Carry a soft, water absorbent cloth to dry off your camera. My camera is a DSLR (Digital Single Lens Reflex Camera). In rain or snow, I keep my camera and lens covered with a rain cover which allows me to safely shoot in snow squalls, downpours, or those misty, foggy snow scenes which are common in winter. You’ve got to protect yourself while shooting too. Holding your camera for long periods of time in freezing temperatures can cause frost-bitten fingers. I use two strategies. If the temperature is not too low, I use gloves manufactured from four-way stretch fleece fabric. With these gloves I have enough dexterity to easily handle my camera and its controls. When it’s bitter, since I use a DSLR, I can use a remote cable inside my mittens to trigger the camera. I preset the camera to set the shutter speed via the exposure meter. I also keep hand warmer packets with me. Exposure problems are the norm when shooting in the snow. Camera meters are preprogrammed to make everything 18 percent gray, so most first attempts at shooting a snow scenes result in underexposed images. Some consumer point-and-shoot cameras and DSLR’s have a snow mode to combat underexposure, but this mode is not perfect. You may still have to further compensate. To compensate, you need to force the meter to overexpose from its reading, by adding “plus” compensation. The amount will vary based on the amount of snow white in the image. For scenes of 50 percent snow and 50 percent shadow, very little compensation is needed. If the entire scene is sunlit snow, + 2 f/stops may be necessary. I usually start with a +1 f/stop compensation, and as I shoot more snow pictures, I determine how much compensation is necessary. You can also handle the exposure problem via bracketing, so within each set of the same photo, one will be properly exposed. Another problem which occurs in cold weather can ruin photos for film photographers; static electricity. Those of us who live in the north know this winter problem well. When we walk on many carpets, we can get a shock when shaking hands or touching a doorknob. This comes from the low humidity conditions of cold weather. When you use a film camera outdoors in the cold, you risk creating a static electricity buildup when your film is wound. If sufficient, a spark may flash inside the camera, fogging the film. It’s rare, but it’s happened to me. So advance the film carefully, and slowly if possible, and only shoot one frame at a time. When coming back inside, condensation can be a major problem, due to moisture from the hotel’s warm, more humid inside air. It condenses on the camera’s cold surfaces. The lens can become completely covered with moisture, as can the film, if any, and the mechanical and electronic components inside the camera. Condensation can play havoc with a digital camera. To avoid the problem, you can let your camera warm up slowly by placing it on a cool windowsill or unheated porch for a couple of hours, to allow your camera to slowly warm to room temperature. I wrap my cold camera in a plastic bag before bringing it inside. The moisture settles on the outside of the bag rather than on the camera’s outside and inside surfaces. Have fun with your camera in the snow and cold.